Superman has sometimes been one of the tougher comic book characters to crack. It's hard to write stories for a superhero that can end almost any conflict within seconds. Some feel Batman is more relatable because he's human and has no powers. Unfortunately, some creators wind up making Superman too weak in their efforts to make him more human. Brandon Routh being shanked by a Kryptonite shiv in "Superman Returns" immediately comes to mind. Critically acclaimed writer Grant Morrison did the exact opposite with his maxi-series, All Star Superman. Morrison embraced the more fantastical elements of the Superman mythos while still capturing the very human aspects of the character. Superman has a dog like anyone else, except his dog can fly and shoot laser beams out of his eyes. The big guy also needs to get away every now and then; it's just that his hideaway happens to be an ice fortress in the middle of the Arctic. All-Star Superman was a throwback to the Silver Age stories published by DC Comics and wasn't tied down to any established continuity. This latest film from Warner Premiere attempts to condense the 12-issue series into a 76-minute movie. 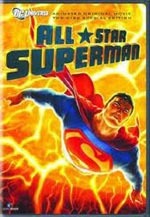 "All-Star Superman" opens with the Man of Steel rescuing a research vessel orbiting the sun. Unfortunately, his archenemy, Lex Luthor has orchestrated the entire disaster in order to poison Superman with an overdose of solar radiation. The last survivor of Krypton discovers that his cells have been super charged to fatal levels. Knowing that he's dying, Superman puts his affairs in order with the first and foremost being his relationship with Lois Lane. He finally reveals his secret identity to Lois and takes her to the Fortress of Solitude for her birthday. While most guys would give their girlfriend flowers or diamond earrings, Kal-El gives her superpowers for 24 hours. Meanwhile, an incarcerated Luthor has only just begun as he enacts another sinister plot to destroy Metropolis.